A set of my works on the 15M indignados mobilization in Spain, and the current wave of mobilizations. Understanding the New Wave of Social Cooperation: A Triangulation of the Arab Revolutions, European Mobilizations and the American Occupy Movement. March 21st, 2012. 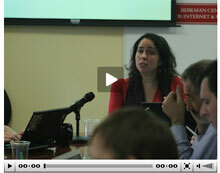 Organized with Berkman center for Internet & society at Harvard University.